Here's another talent search that's sure to open great opportunities for young and talented Filipinas dreaming to be recording stars! The mechanics of the search is very much like that of American Idol wherein hopefuls just walk in and try to wow the panel of judges with their respective performances. If the judges are impressed, they gain a much-coveted spot in the eliminations. There will be several elimination rounds to be held at various PADI'S POINT branches. The winners of this search will be part of an all-new female performing group to be managed by highly-acclaimed songwriter Mr. Alan Ayque. The girls will be extensively trained and groomed before being launched into the highly competitive world of entertainment. The group will also work on a debut album to be released under Ivory Music. Maria Clara is the heroine in Noli Me Tangere, the controversial novel of Philippine national hero, Jose Rizal. In the novel, Maria Clara is portrayed as blessed with utmost beauty and grace, delicately pure but remains to be of virtue --- the ideal Filipina as far as Rizal is concerned. However, more than a century has passed since Rizal's time and it seems that Filipinas have now become tougher, more independent, more confident with their talents and skills, but of course, still beautiful and dignified.^^ Such qualities make up the modern Maria Clara and also define what this new girl group is all about. 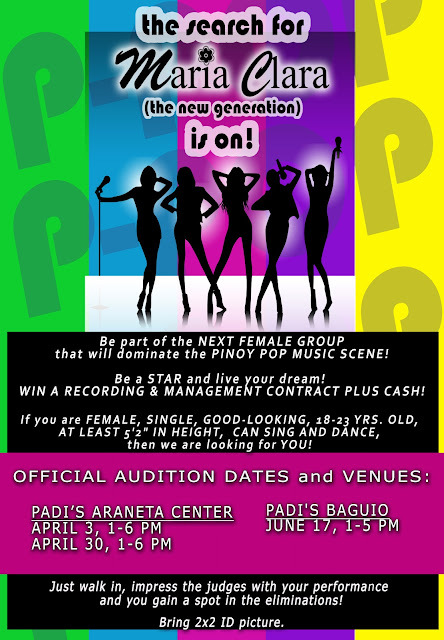 THE SEARCH FOR MARIA CLARA is set to kick-off on APRIL 3, 2013 with the first audition to be held at PADI'S ARANETA in Cubao. Those from Visayas and Mindanao will also be given a chance to showcase their singing and dancing prowess via online audition. For full details and for more information, please check THE SEARCH FOR MARIA CLARA FB FAN PAGE and follow @Search4MaClara on Twitter.